It’s Groundhog Day! I repeat: It’s Groundhog Day! The movie Groundhog Day first played to paying audiences 20 years ago today. I saw it soon after the release, and fell instantly in love with it. But only now, 20 years later, am I willing to give it my highest rating: A+. I don’t give that rating to new films–or even those only 19 years old. Nineteen years ago, when everyone was talking about the best films of 1993, the two titles on everyone’s lips were Schindler’s List and The Piano. They were on every critic’s Top Ten list. Everyone assumed that one of those two, most probably (and correctly) Schindler, would take the Best Picture Oscar. Groundhog Day made few lists (only one that I saw), and wasn’t even nominated. But two decades later, Schindler is more respected than loved, and The Piano is all but forgotten (which is unfair; it’s an excellent film). Yet Groundhog Day is more loved and respected than both of those serious works put together. No one predicted that in 1993. Not that this is a full-proof system. When they were 40 years old, the better Marx Brothers movies looked like timeless masterpieces. Now, at 80, they’ve lost some of their luster. Their impolite, anti-authoritarian, surreal style fit very well with the 1970s, but less so now. So what, besides its age, gives Groundhog Day that A+? Few other motion pictures are as spiritual and as humane, and certainly none that wrap themselves up in the entertaining package of a slick Hollywood comedy. Without explanation, it places its self-centered protagonist into a time warp that becomes his purgatory. Living the same day over and over for who knows how long (it could be thousands of years), he goes through stages of panic, giddiness, and despair before figuring out what life is all about: charity and loving kindness. The film would never have worked without Bill Murray. His deadpan delivery hits every note and every punch line as his character goes through one change after another. He’s loveable, even when he’s a jerk. We feel his despair as he realizes that he’s trapped and may never get out, and his deepest depression when he wins Andie MacDowell’s love, knowing full well that come the morning, she’ll only remember him as a jerk. 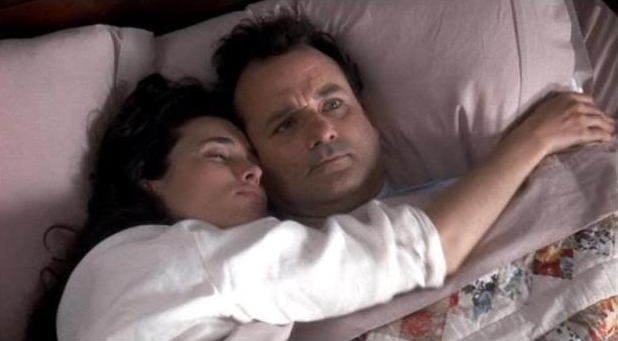 Groundhog Day manages to be both profound and profoundly funny. What else can you ask of a work of art? 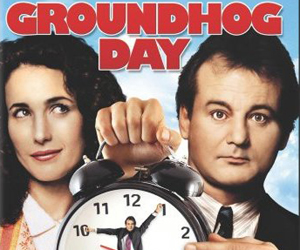 The New Parkway screens Groundhog Day tonight at 10:00.